When I first created ADworld Experience in 2012, the main goal was to understand what the best specialists in the PPC industry were doing, in order to improve my own campaigns. 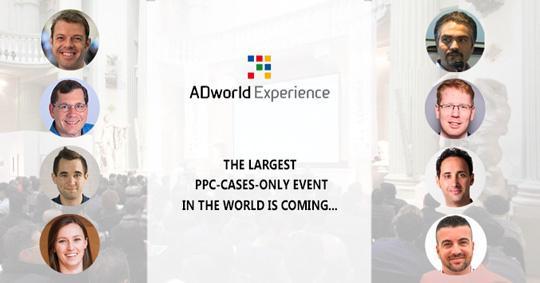 Over the past years the event has been growing considerably and now we are ready to run the World’s best event in the Pay Per Click sector (with Google Ads, Facebook Ads, Amazon and other minor platforms + CRO real case stories). Organizing it in Italy (a secondary market in the global web) is another challenge that has always motivated me even more. Of course, I am not doing it as a no profit initiative, but, believe me, this has never been my main objective, also because I always thought that if I could make an excellent event, money would have come, sooner or later. In my opinion we have been doing a great job on that since the first edition. And a large part of the merit for this has to be credited also to a team of Italian PPC specialists (who has always helped me with great willingness and professionalism), to Stravideo (our filming and streaming partner) and to NUR (that starting from this year is supporting me on the organizational side). Of course, there have also been road accidents, mainly due to my evaluation errors, but this year there was an important change. Many American professionals (among the most important in the sector) have contacted me themselves to ask if they could talk about their case studies. I was even forced a few months ago to answer that we wanted to keep a relevant European perspective for the event and therefore we could not accept their proposals, even if they were very interesting. The secret of success of any professional event lies not only in the selection of the right speakers, but also in motivating them and keeping topics strictly focused. Some speakers in the past have come to “make catwalks” with us and selecting only famous players would not have automatically created an high added value event for participants. This is the main difference between ADworld Experience and a lot of events I have attended to personally, which are often a business in themselves (or are intended to increase notoriety of those who organize or join them). I do not choose speakers because they are famous or because they are friends or friend of friends or because they are good at telling stories. I choose them because they have something interesting to show to a PPC specialist like me. From this point of view the coming edition promises great things, at least judging by the fact that almost 3/4 of the live seats available in Bologna have already been sold (2 months before the date of the event)! Frederick Vallaeys, creator of Optmyzr (one of the most widespread Google Ads campaign optimization tools in the world), will be the moderator of the international session (as in 2018), while Fabio Sutto (Performance Based) will manage the Italian market one. Shahina Meru & Megane Bellod (from Merkle Periscopix, one of the largest global performance marketing agencies in the World). There are few others to be confirmed, but the playground is set. And you can bet it will be a super-match! 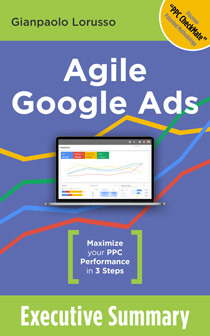 + if you know a little of Italian, you will find another 12 top PPC professionals telling Google Ads, Facebook Ads, Amazon & CRO success stories. If I were you I would subscribe ASAP, because registration prices will grow while available seats left on April 4-5 in Bologna (Italy) vanish and it will be quite expensive to join last minute (if you will find any place at all).